What we're mainly looking at here is shapes and styles rather than content, so don't be put off by the downpage article on the front . The articles are mostly taken from issue 6820 to give a bit of realism to the whole thing, but they've been simply hacked off at the end where they're too long so this isn't a finished product or anything. On page 16, some explanation is given for the new pages, on news content etc. What I've tried to do is increase the amount of information going in without making life more difficult for the editors (as news in particular is often something we have to fill ourselves) or in terms of layout. The reason for the redesign is largely time and space considerations. As a smaller format, it's foldable by our printer, potentially cutting down on turnaround time. It's also more attractive to small shops, who need to put aside less room for it. Finally, it gives a chance to incorporate some ideas which have been batted around for a while by readers and writers. This should actually be reasonably doable. We have someone who has volunteered for the theory/history page, and if we can find someone who wants to take on 'get active', that should ensure there's no more work to do than there was before. However, this is all subject to what people think, primarily the other editor, layout, and our printers. What do folks think? Any feedback would be welcome. alright mate looks really good. Jack, pretty much all sales are through subscription. Selling it isn't a problem. If anything upping the price would make retail outlets more likely to sell it. You could even maybe increase subs by giving current-price subs for next year when upping the cover price. AFAIK subs and sales didn't go down when we upped the price 60% overnight. 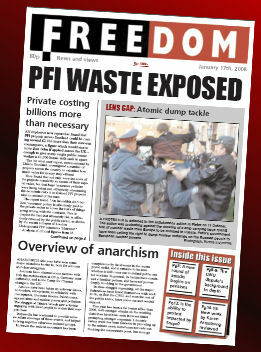 I can't see the point of subsidising anarchists to read anarchist publications. Anarchist readers should be subsidising outreach to non-anarchists. hmmm, maybe I've heard wrong but I thought the sales figures were pretty low? (maybe pm me if you don't want to discuss this here). From what i heard any ambitious plan would aim to increase the sales by a good bit and I don't think a higher cover price would help that - though you do have a point about a higher cover price making it more enticing for retailers. jack - that's basically true, like I said pretty much all sales are by subscription. (At least when I edited it, what 2 years ago?) This is basically just because it's not sold very much publicly. £1 or £1.50 for a magazine would still put it right at the bottom of the cost end of the "radical" market, and would I think still be at a loss (well a quid would be for sure). This would at least stem losses, or even turn a profit which would ease pressure to allow time to sort out selling the damn thing. looks very good. printed out the first page to get a feel for layout and it has a good feel to it. 3) price - £1.00 would be acceptable. maybe even increase subscriptions a tad too? Suggest we need more short reviews: music, films, games etc (popular culture) to give it currency, give it more appeal to people who want more than just politics. Yeah we had a quick check using the CNT's version, which has similar paper and is A4, they staple but taking those out it still seemed to work fairly well, so I'd reckon not. I'm still really wary about doing a full-on magazine, as it means we'd have to start putting out the same style stuff as Organise/Black Flag/DA, just a bit more frequently, which requires a major rethink in content. Sorry. may be closer with suggesting a news magazine like the Economist, New Statesman etc, keeping in that newsgathering aspect while also converting a bit more towards the analytical side (we do this to a certain extent already, but it might be worth pushing that angle more). £1 would probably be doable, on street sales people quite often just say keep the change, though yeah I agree the higher the price the less likely it is than non-politicals would pick it up (6p per A4 page is a lot compared to the Guardian for example which would be more like a penny or two for a Berliner format). Yeah short reviews would be good, though we may well have a candidate for the role of reviews editor so you might need to talk to them soon rather than me . That's what I meant. a glossy front and back cover would make it more attractive to sell as well. Like the look. Would be nice to have a nice neat A4 publication with color photos (stapled please - keeps it tidy). A4 always better for storing! Stick the price up to a quid - which is still ridiculously cheap! Would rather it stick with 80gsm paper than glossy - dont need another mag style publication. Also looks better and is easier for street selling. I reckon a news magazine, economist stylee - would be good both for content and appearance (and sales). It'd also probably make back issues a bit more desirable. Can we find ways of increasing user generated content? I find much of Freedom is there to be read and then .... filed away. There's not much by way of active discussion and debate. A somewhat cliched idea (but usable?) could be a "problem" page. you really need to change everything before you can solve that one. Kind of like an anarchy aunt, Malfunction?